Imagine a well-shuffled Tarot deck formulating the blueprint for an eccentric village, every picture unfolding into picturesque architecture, every background transforming into real ground, every portent a literal signpost. 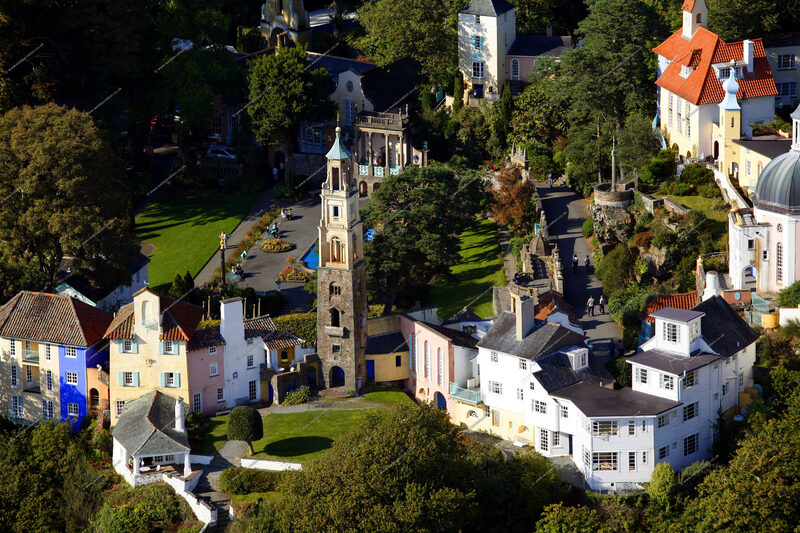 The idiosyncratic coastal village of Portmeirion, Wales is exactly such a place—a Tarot deck made manifest in mortar and gold leaf. Around one corner, a statue of a cherubic Fool stands blithely on the edge of a rocky precipice (photo). Down another path, the World sits atop the shoulders of a Hercules statue (photo), while the God-Empress Frigga looks on (photo). Elsewhere, St. Peter pontificates from a balcony like a true Hierophant (photo), in the shadow of a soaring Italianate Tower (photo). Taken together, the assorted facets of Portmeirion are eerily like an elaborate spread of divinatory cards—an esoteric pop-up book of sorts in which all the archetypes interrelate in three dimensions. With its structures cascading down a lofty cliffside, the village’s winding, stepped paths of varying elevations provide innumerable vantage points to study the relative iconic connections. Archetypes may be adjacent or separate, above or below one another, all depending upon one’s standpoint. The village can be viewed as one elaborate allegorical story, told from multiple perspectives. 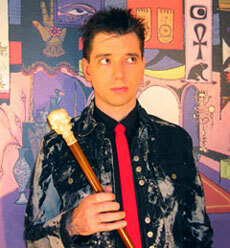 As Tarot scholar L. W. De Laurence noted, allegory and symbol are inclusive of all nations and times. 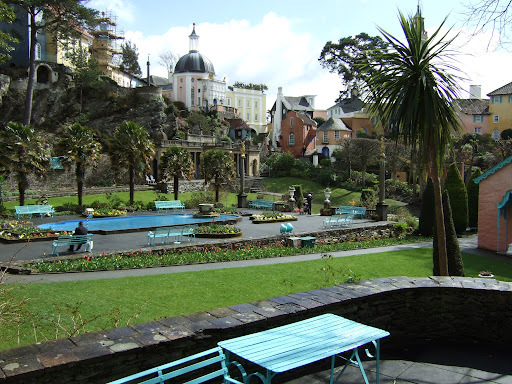 Hence, “the cards correspond to many types of ideas and things; they are universal and not particular.” As Portmeirion is a pastiche of architecture and ornaments from different cultures and eras, it’s a uniquely perfect setting for the Tarot archetypes to spring into life. 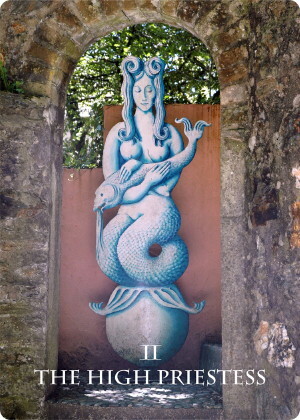 Like all works of art, the statues, paintings, and architecture of Portmeirion find their meanings in the beholder’s interpretation. Is the concrete planter emblazoned with a relief of a trident-wielding King Neptune a reflection of the King of Cups (photo)? Do the two Balinese dancers atop Ionic columns in the piazza epitomize the Two of Wands? Visitors must come to their own terms, according to the context of their situation and the call of intuition. 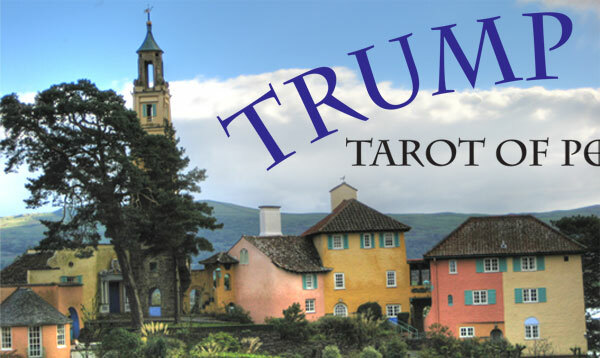 This web site is a proposed representation of the Tarot at play within Portmeirion, to serve as an inspiration to the unconventional traveler eager to read the signs and portents all around.